The 1924 New York to Horta, Azores cable was manufactured by Telcon for the Western Union Telegraph Company and laid by CS Colonia, assisted at the New York end by CS Robert C. Clowry. The cable was completed on 20 September 1924, and was the first commercially operated cable to use permalloy (developed by the Western Electric Company of the USA). The permalloy loading enabled this cable to operate at about four times the speed of a conventional cable of the same length. A 35mm film about the laying of the cable was made by Charles W. Barrell for Western Electric and released in 1925. The film itself is lost, and only a detailed scene list survives.This may be viewed at the link, courtesy of the AT&T Archives and History Center. The copper conductor [a] is wrapped with flexible copper tape [b]. Next is the permalloy tape [c], whose magnetic properties give the cable its increased speed. Then follows a thick covering of gutta percha insulation [d], a wrapping of jute [e], eighteen steel armor wires [f], and an outer wrapping of hemp cords [g]. The 1926 cable on this route also used linear loading; the 1928 cable used taper loading. See also Cal Sheckler's account of the diversion of the Azores-Emden section of the 1926 Western Union cable during World War II, for the use of the Allied Forces in France after D-Day. Information above from Haigh and Casper; illustration from Casper. One of the most recent developments in the art of submarine telegraphy is that of the Permalloy Cable. Engineers discovered that certain nickel-iron alloys, when properly heated, possess remarkable magnetic properties. These properties are developed in alloys that contain more than 30 per cent. of nickel and that have the face-centered cubic arrangement characteristic of nickel crystals, rather than the body-centered structure characteristic of iron. The entire range above 30 per cent. nickel exhibits these properties to some degree and offers new possibilities to those interested in magnetic materials. The most startling results, however, are obtained with alloys of approximately 80 per cent. nickel and 20 per cent. iron, whose permeabilities at small field strengths are many times greater than any hitherto known. The development of permalloy has assured a revolutionary change in submarine-cable construction and operation and, in addition to this, equally important applications are possible in a number of other fields. 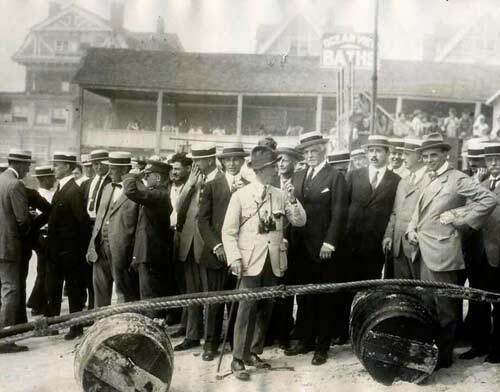 These International Newsreel photos show the scene at the landing, and the caption on the back of each photos gives a description of the event. New Cable Line Completed Across Atlantic. The American shore end of an entirely new type of submarine cable, which will transmit signals at several times the speed of any long cable now in existence, and which will utilize important new discoveries in electrical science, was landed at Rockaway Beach, New York, on Tuesday Sept. 20 . The new cable is not only an electrical innovation of the first importance, but is also the first direct cable from the United States to southern Europe. It runs from New York to the Azores and thence will be extended to Rome by way of Malaga, Spain. The system thus completed provides facilities for cheaper and speedier communication with the south of Europe. 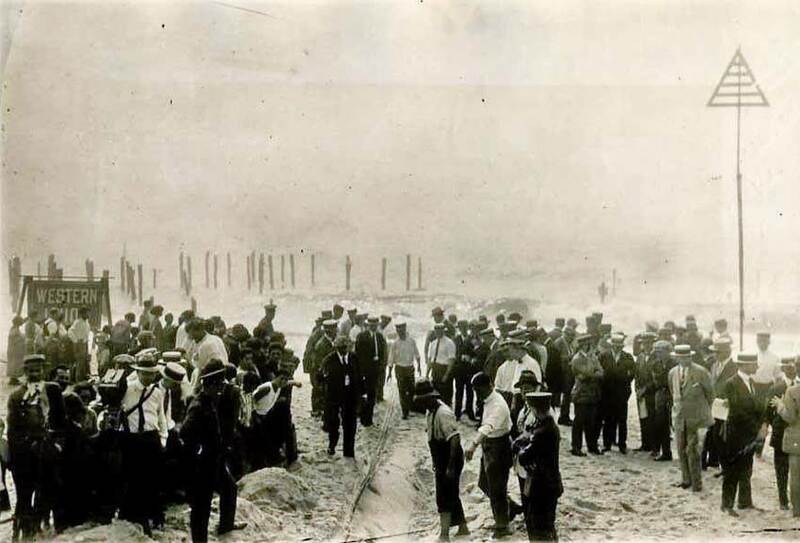 The cable is laid on the ocean bed in a direct line from Rockaway Beach, where the Western Union cable station is situated, to Horta on the island of Fayal in the Azores, a distance of 2360 sea miles from Horta to the coast of Italy. The cable line will be completed by La Compagnia Italiana del Cavi Telegrafici Sotto-Marini, of Italy. This part will be in two sections; the first from Horta to Malaga on the southern coast of Spain, a distance of 1340 miles and the second section from Malaga to Anzio, in Italy, a distance of 997 miles. The total length of the new line will be 4704 sea miles or about equal to 5422 land miles. Officials of the cable company were at Rockaway Beach to view the landing of the American end of the new line of communications.